Rest For Your Souls | gather the folks. tell the stories. I am pleased to announce that I will be joining my colleague, the Rev. Dr. Kelly Murphy-Mason, for a three week series on grief and loss as part of a partnership with Trinity Wall Street. 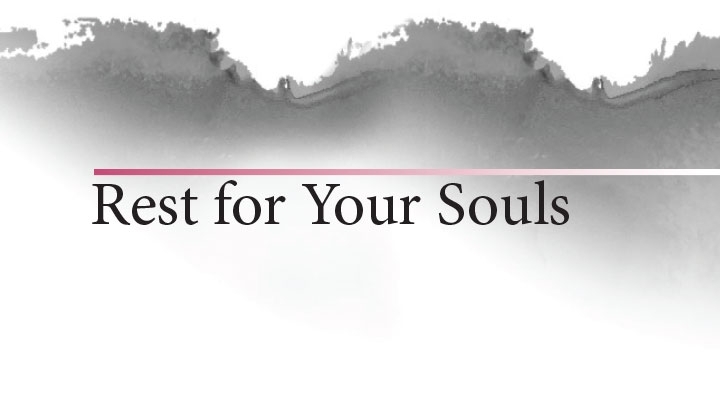 You can find more information here, including details for a worship service to be held this Sunday evening, May 17th- Rest For Your Souls: A Eucharist for Those Experiencing Grief and Loss. Three years ago, I worked with the Board of Deacons of my previous congregation to create a Blue Christmas liturgy, a similar service meant to acknowledge the reality of pain and loss that comes as an essential and unavoidable part of our human condition. The timing of the Blue Christmas service suggests that the anticipatory and joyful season of Advent/Christmas can be extraordinarily painful for those who would have an empty place at the holiday table. But, as we know all too well, there is never a ‘good’ time to lose a loved one, whether by death, divorce or estrangement. There is never an ‘obvious’ time to grieve their loss. Grief and loss can pervade everyday life if not properly attended to, and we live in a culture that rarely grants us permission to attend to grief. We are supposed to ‘be strong,’ or ‘move on,’ or ‘count our blessings,’ or any number of other cliches that do nothing more than convey the message that others are made uncomfortable by our sadness and would like it to go away, or be hidden away. Oh, there are so many other ways to attend to grief! To acknowledge the loss; to explore its many angles and rough edges; to grant gentleness and kindness and grace to grief’s process; to seek the possibility that if grief does not ever go away completely, that it might be embraced in such a way that it no longer needs to cry out for attention. To fold grief into the fullness of our human experience, rather than shun it. Grief will have its say, one way or another, and the longer we shut it up, the louder it may become. This is my way of saying, if you have experienced loss recently (or ever! ), come to worship this Sunday to receive readings, music and meditation with the Rev. Dr. Mark Bozzuti-Jones, Dr. Kathy Bozzuti-Jones, and the Rev. Kristin Kaulbach Miles. And then join the Rev. Dr. Kelly Murphy-Mason and me for the follow-up series on grief and loss, taking place on May 20, May 27 and June 3. All are welcome. P.S. I found this old sermon of mine from Advent 2013. Yes, I realize we are on the edge of Pentecost, but the message isn’t stale or expired. Darkness threatens to prevail all the time, and we are never not ready to receive the promise of the bright, flickering light of one candle that can not, will not, be extinguished. This entry was posted in Grief Workshop, PSI, Psychotherapy and Spirituality Institute and tagged bereavement, Blue Christmas, Christianity, grief, liturgy, loss, PSI, spirituality, Trinity Wall Street, worship. Bookmark the permalink.